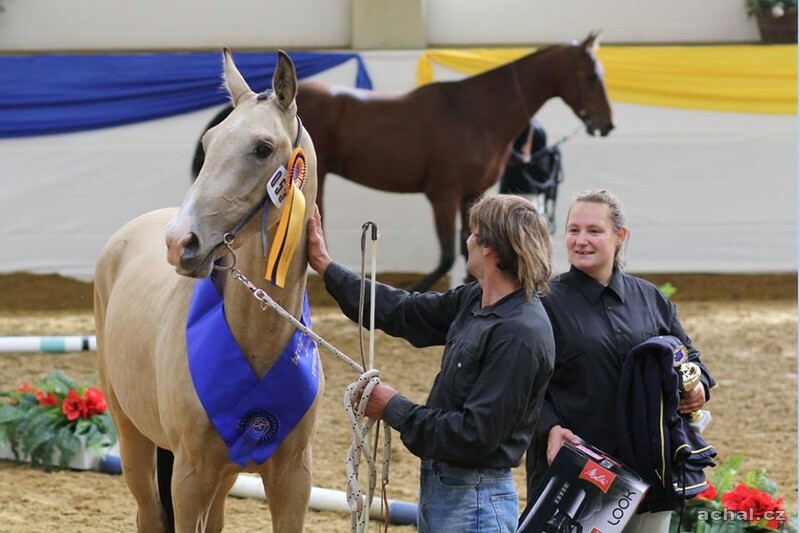 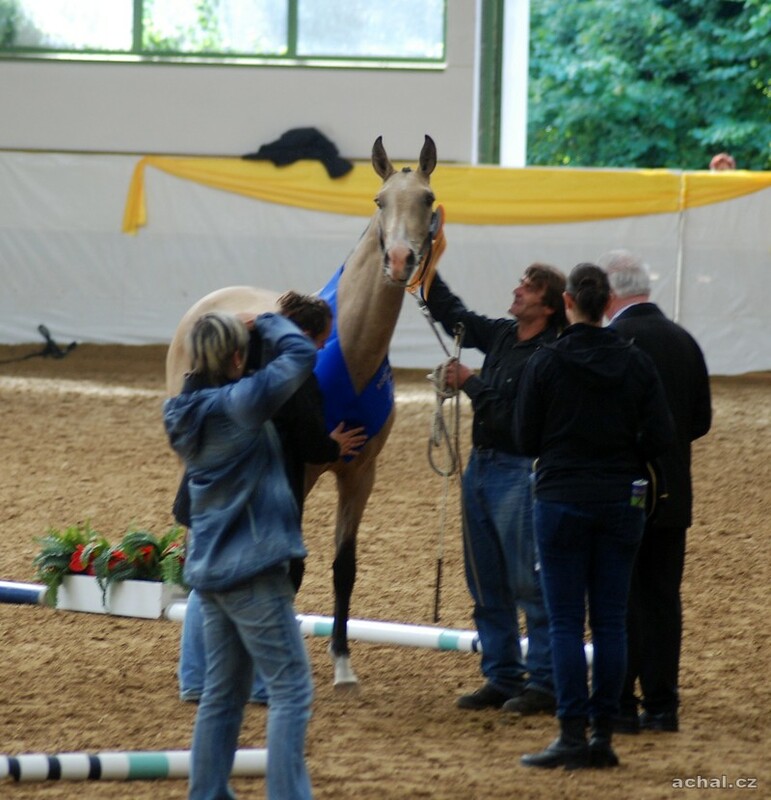 European Championship 2014 (Germany) 2 year old stallions - place I.
Sergesdan was born 30.5. 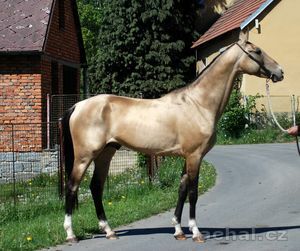 2012 at birth was 105 cm is very strong and communicative stallion. 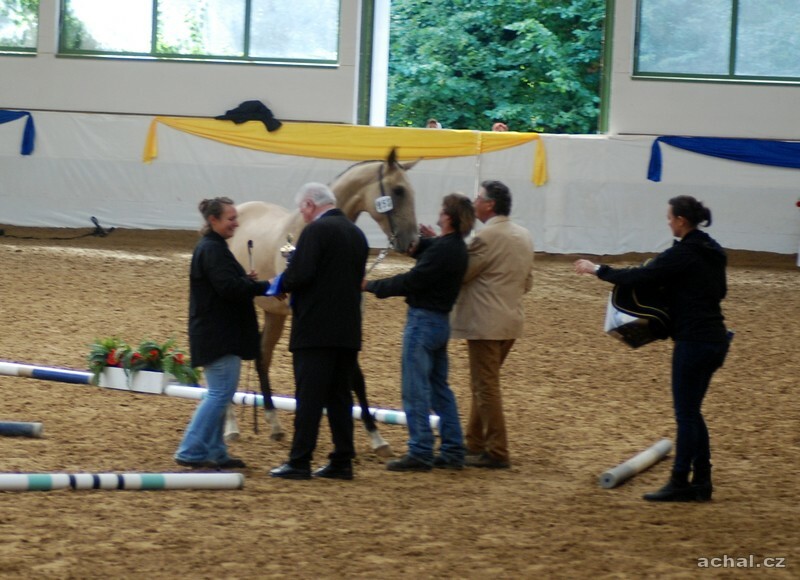 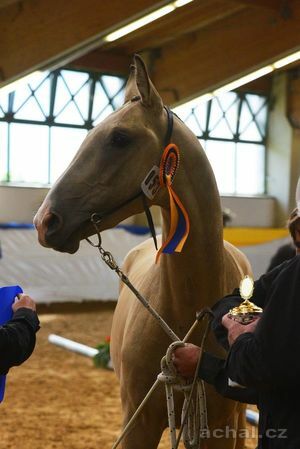 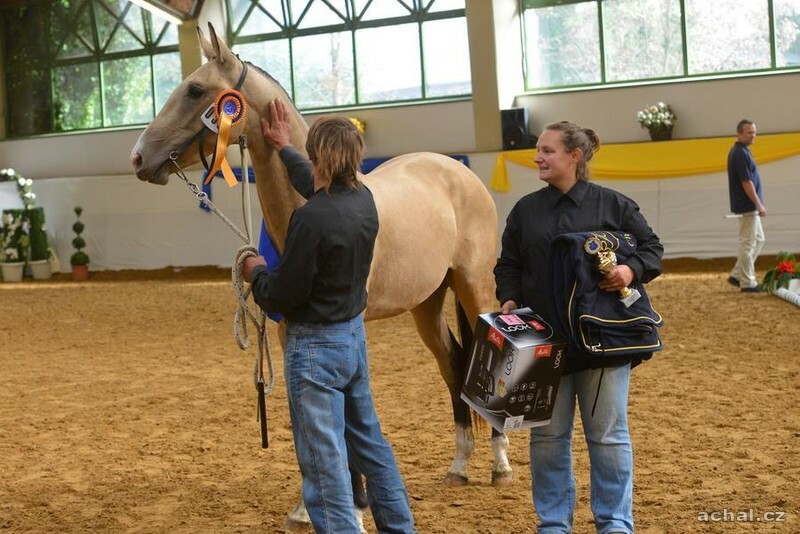 Sergesdan won the first place in the category of 2-year-old stallions and Champion. 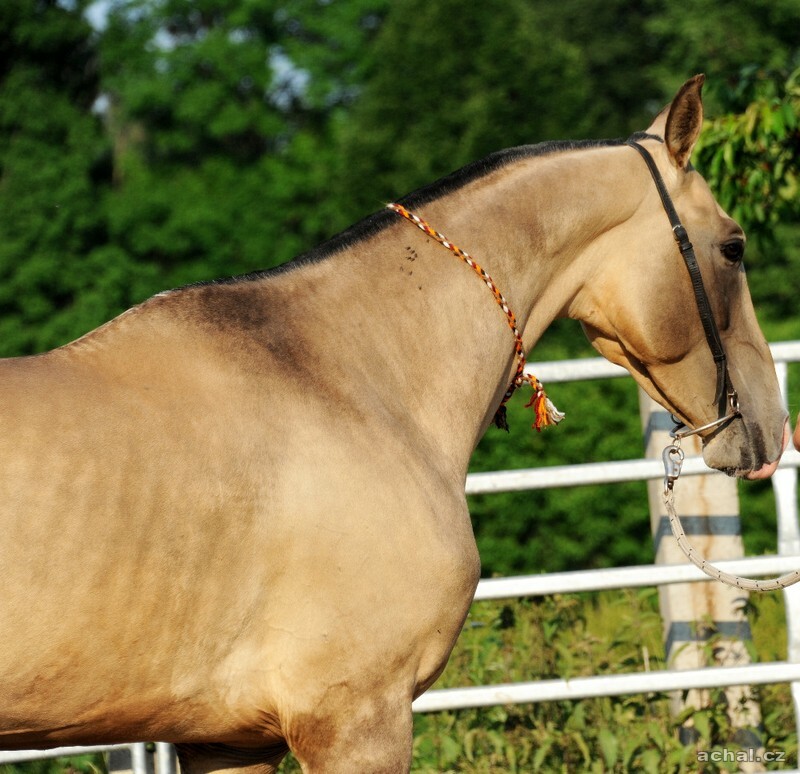 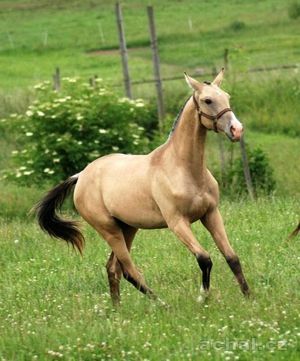 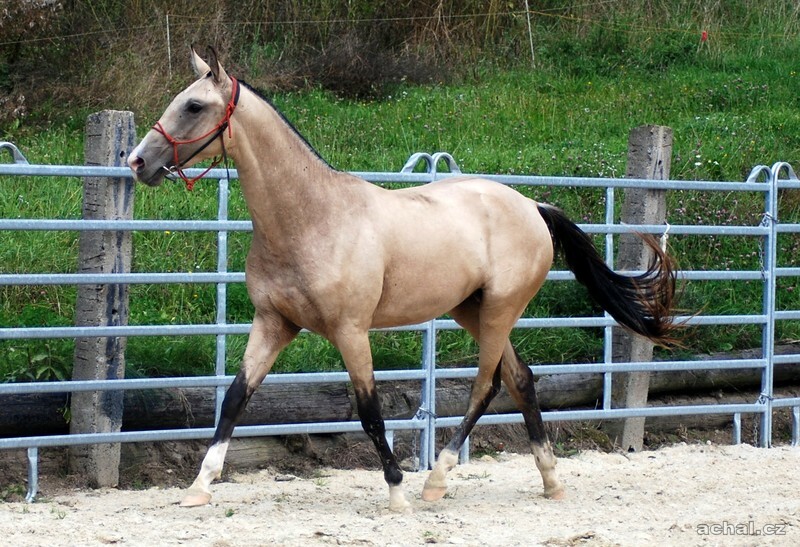 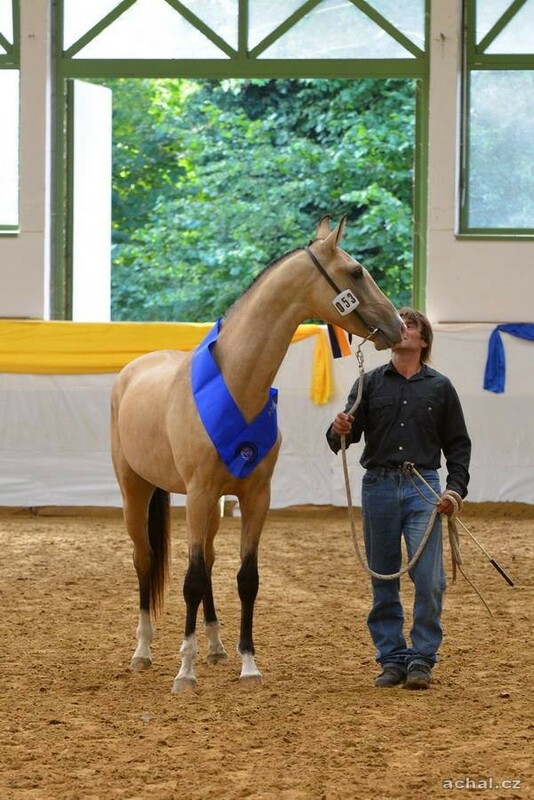 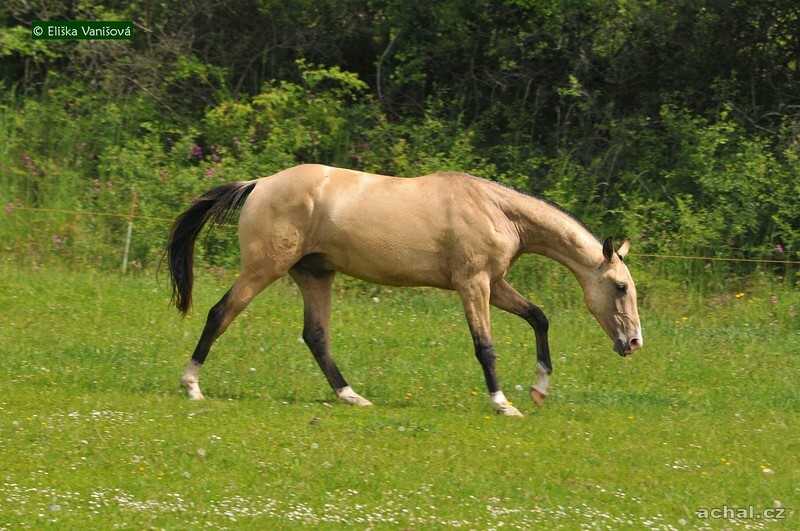 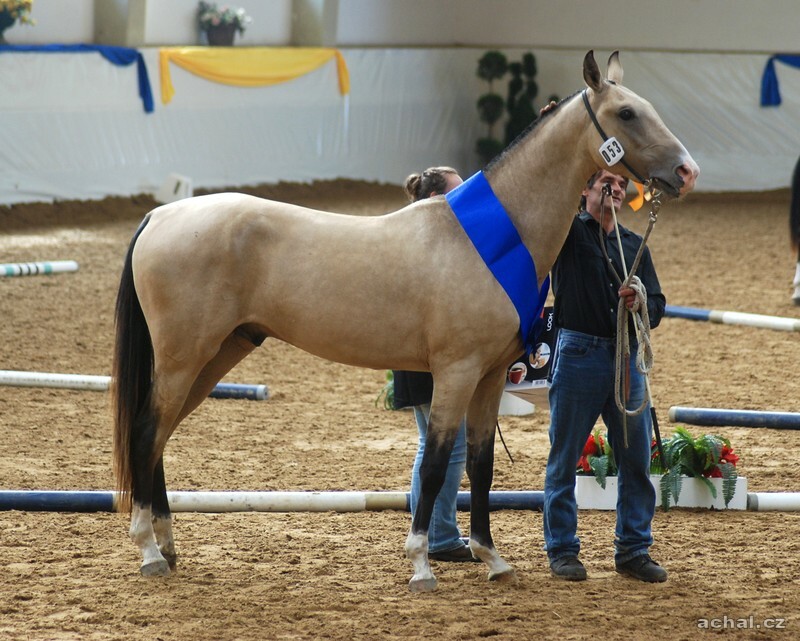 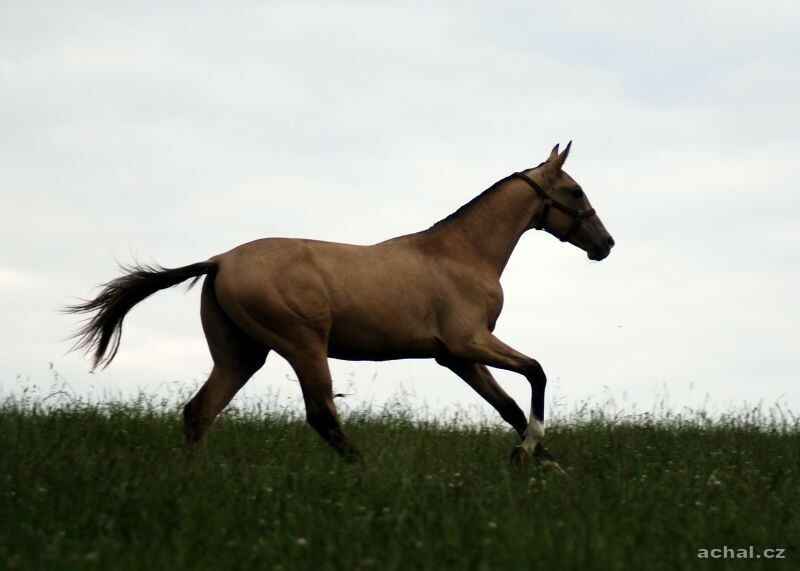 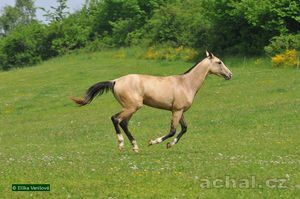 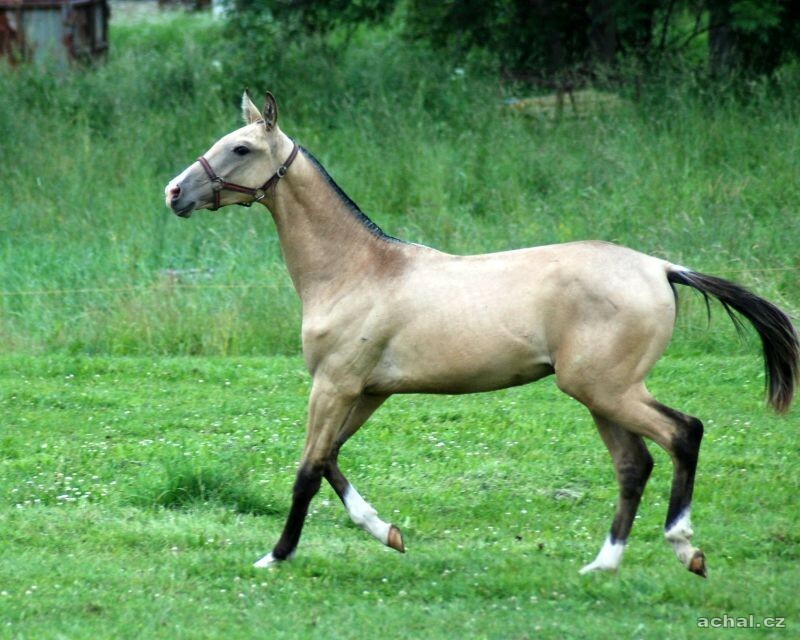 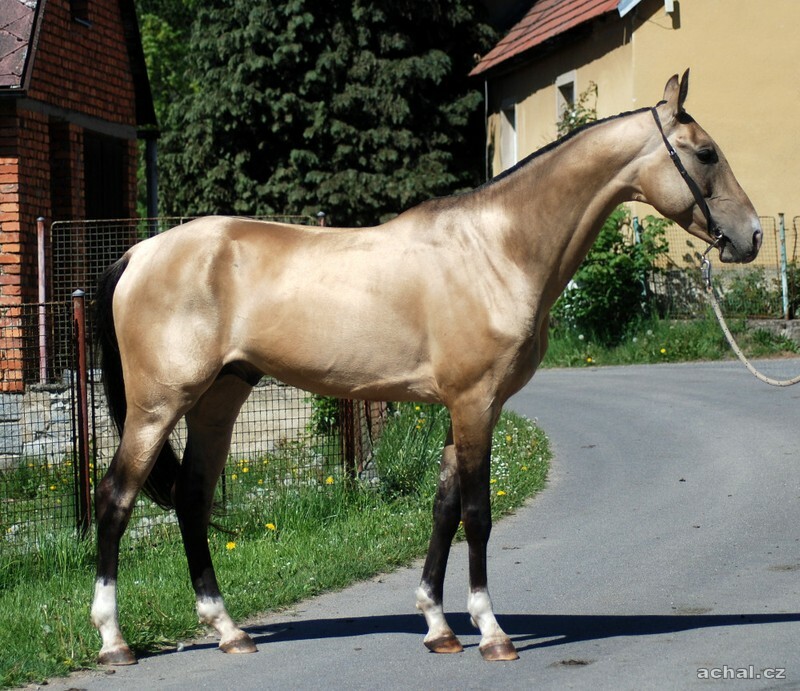 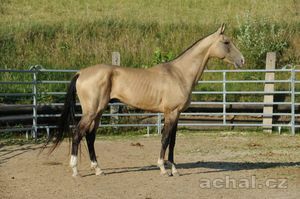 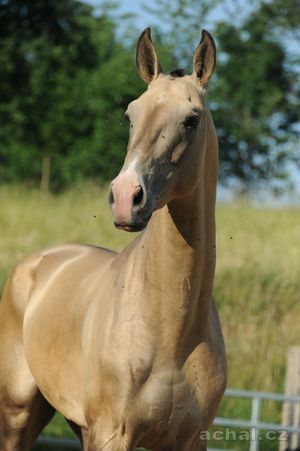 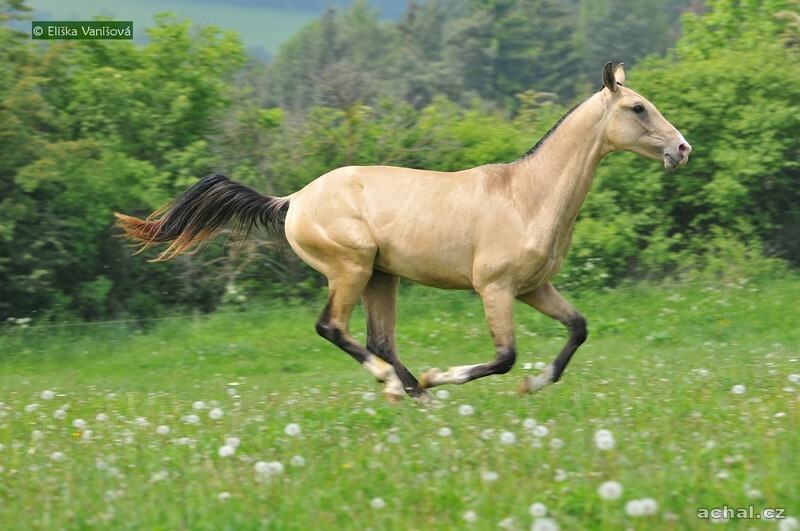 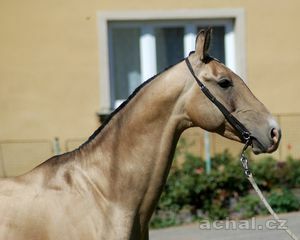 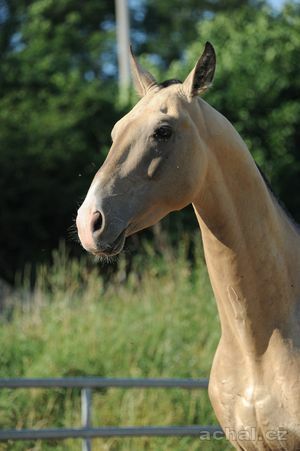 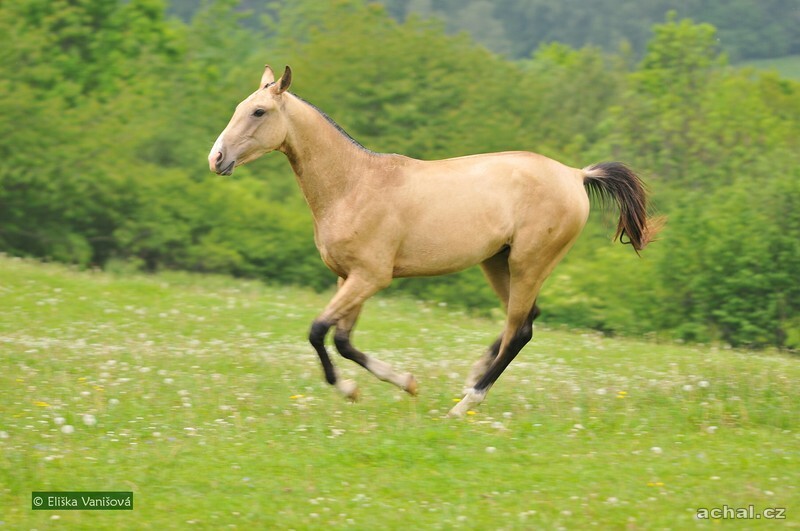 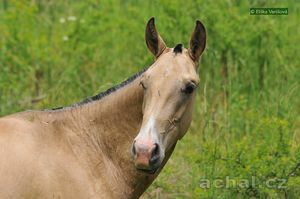 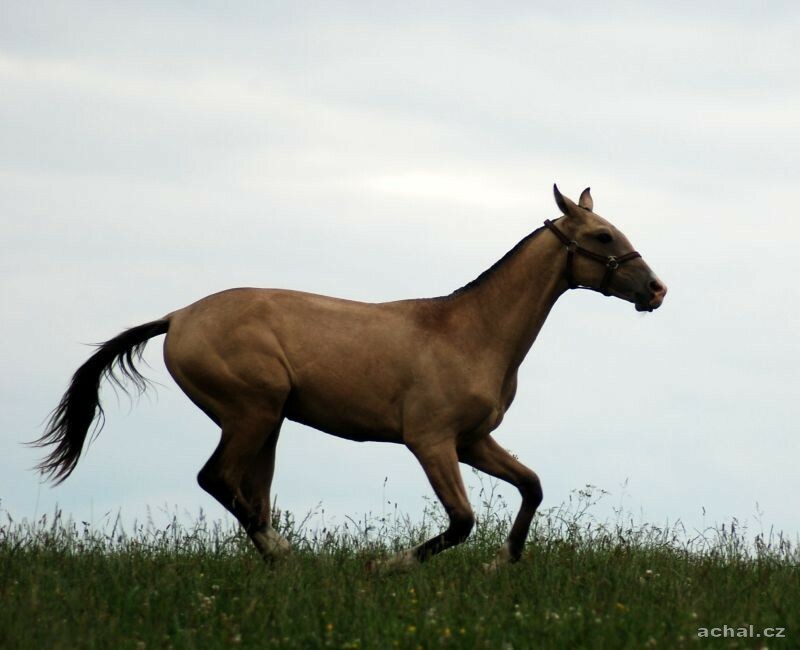 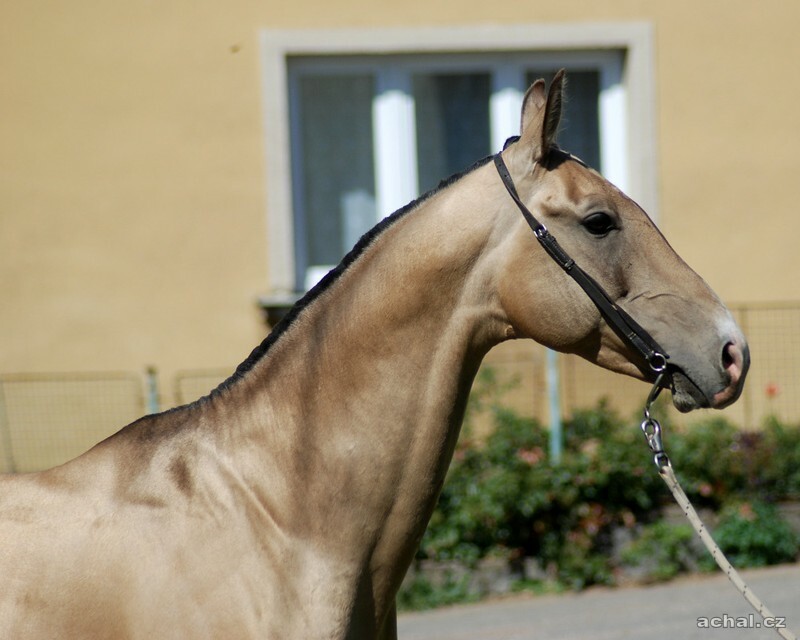 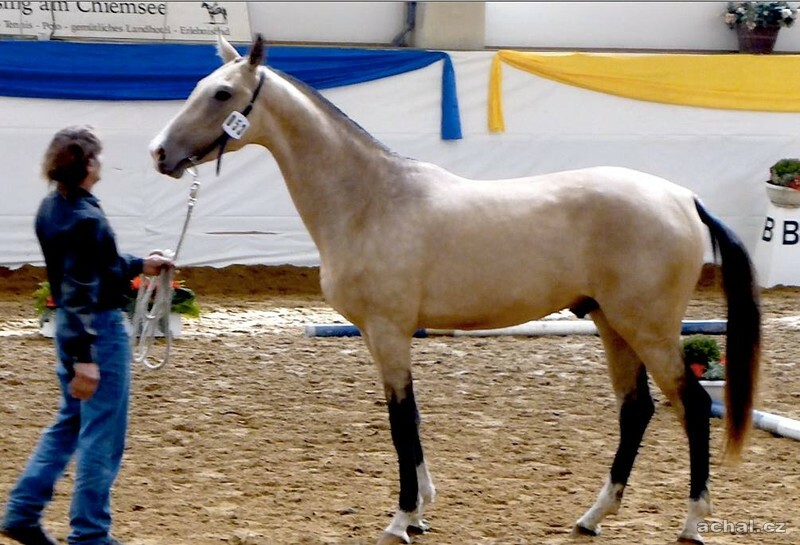 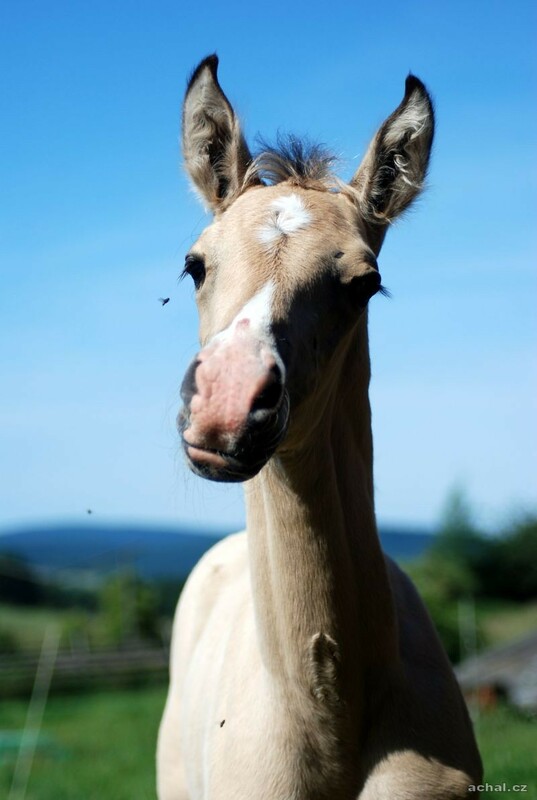 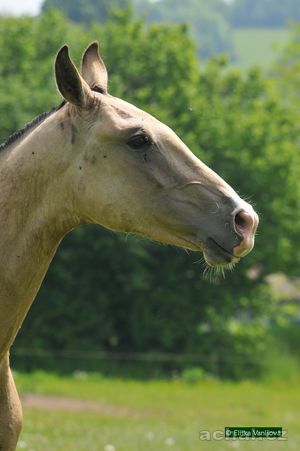 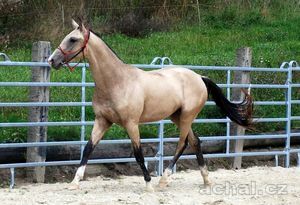 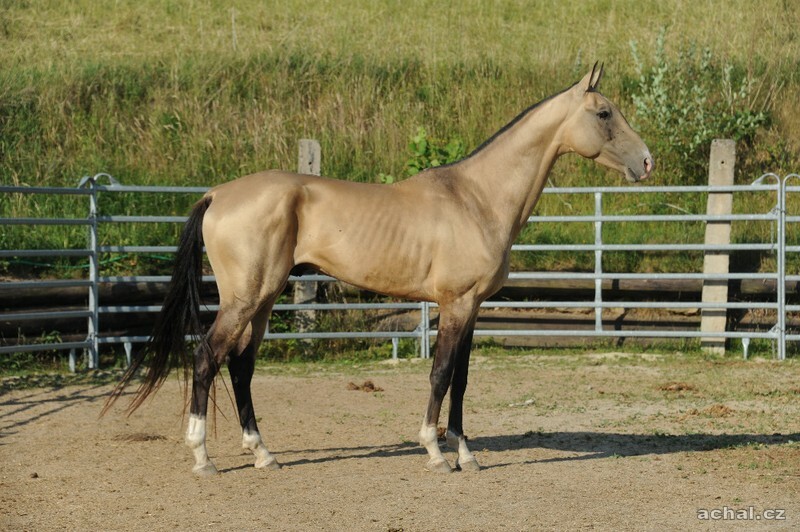 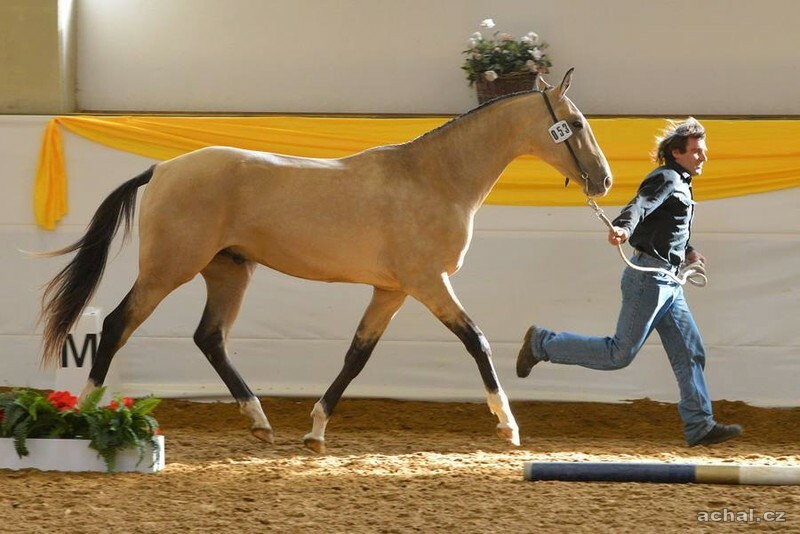 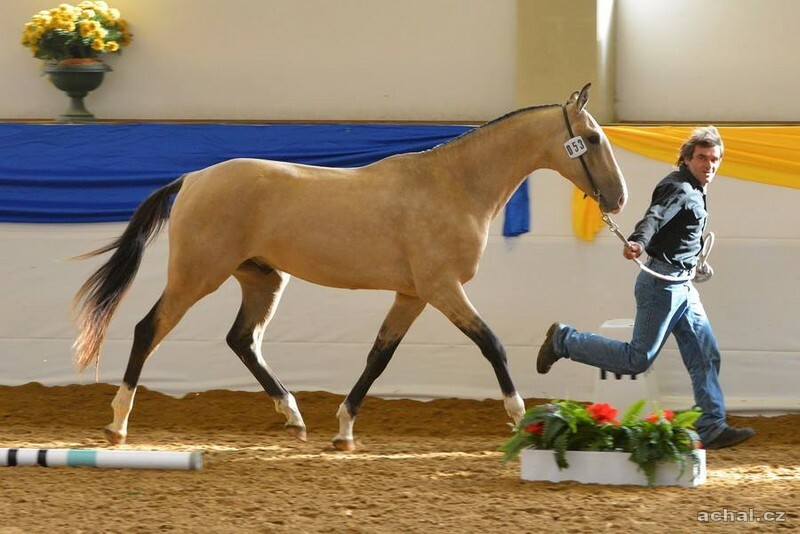 Father: SERDARJAN golden buckskin - stallion Born: March 8th, 2005 at Akhal-Teke EST Stud, Estonia. 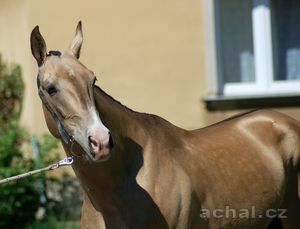 Bred by Stavropol Stud, Russia. 8,2 - 7,8 - 8,0 - 9,0 - 0 - 0; Elite III kat. 8,3 - 7,8 - 8,0 - 9,5 - 0 - 0; Elite II kat. 17.08.2013 Rõuge Rännak, esmane kvalifikatsioon 42 km (keskm. 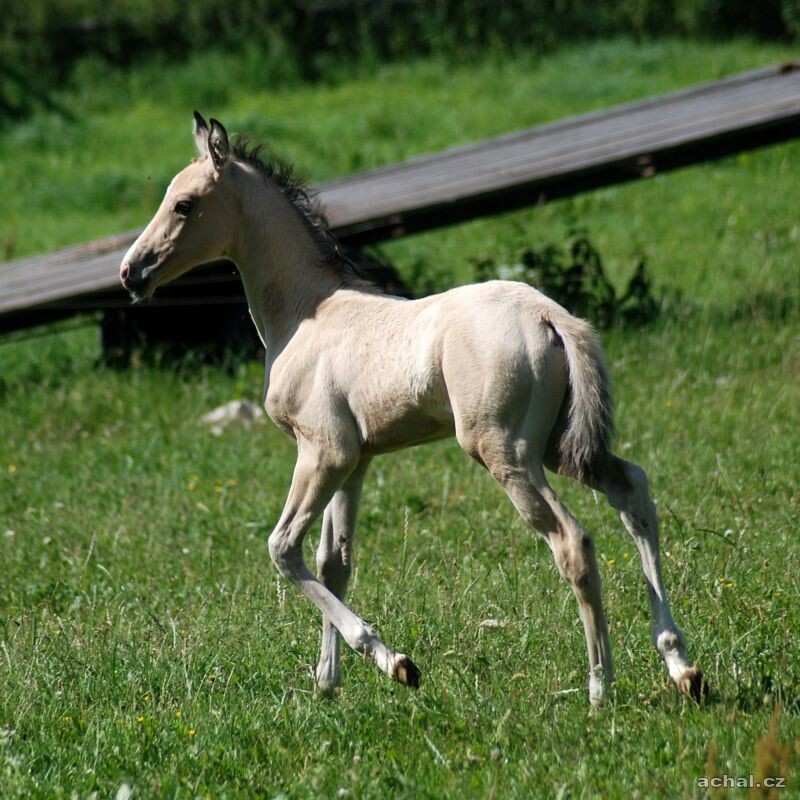 kiirus 10,39 km/h; taastumisaeg 0:33:29). 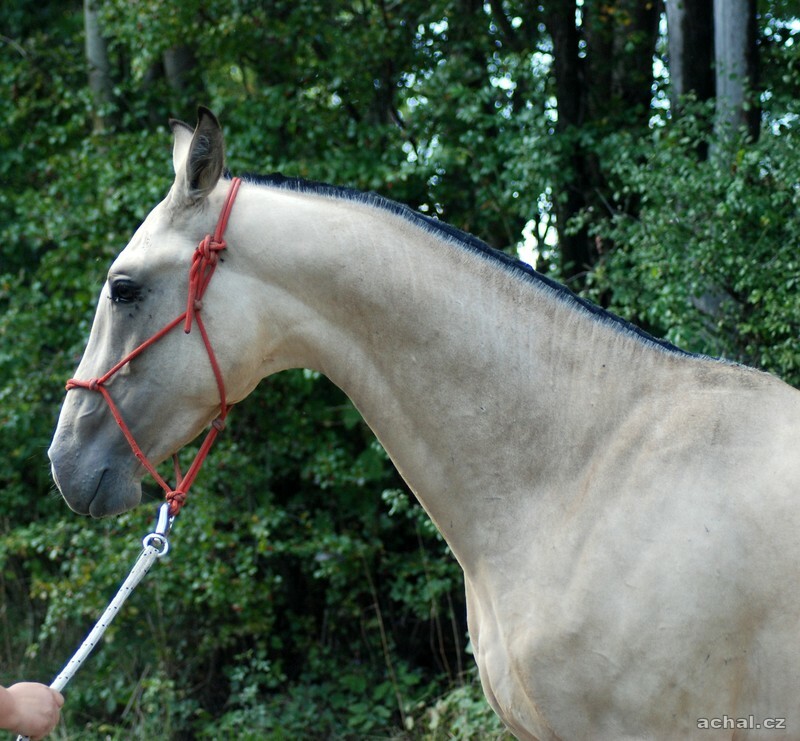 Serdarjan is a lovely Sere-line stallion who was imported in-utero. 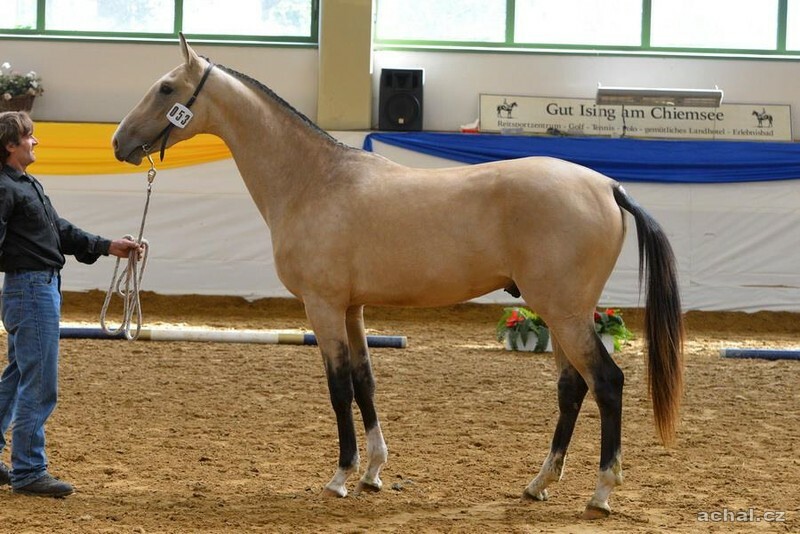 He was bred by Aleksander Klimuk, Stavropol Stud and born farm Achal teke EST. Serdarjan’s sire is 1099 Serasker who is a son of the line founder Sere himself; Serdarjan's dam is Firiuda (line Gelishikli (Gundogar)), coming from damfamily Fantaziya (Gezel). 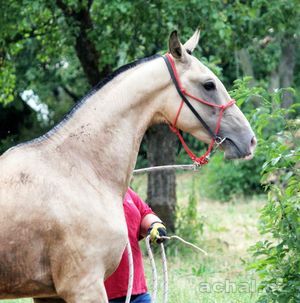 Serdarjan is a nice stallion with good size and look. 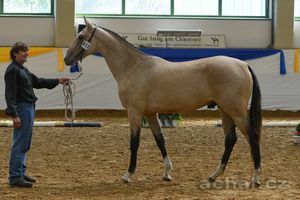 He is so similar to his sire Serasker that his breeder Mr. A. Klimuk said about Serdarjan - "like a copy of his father". 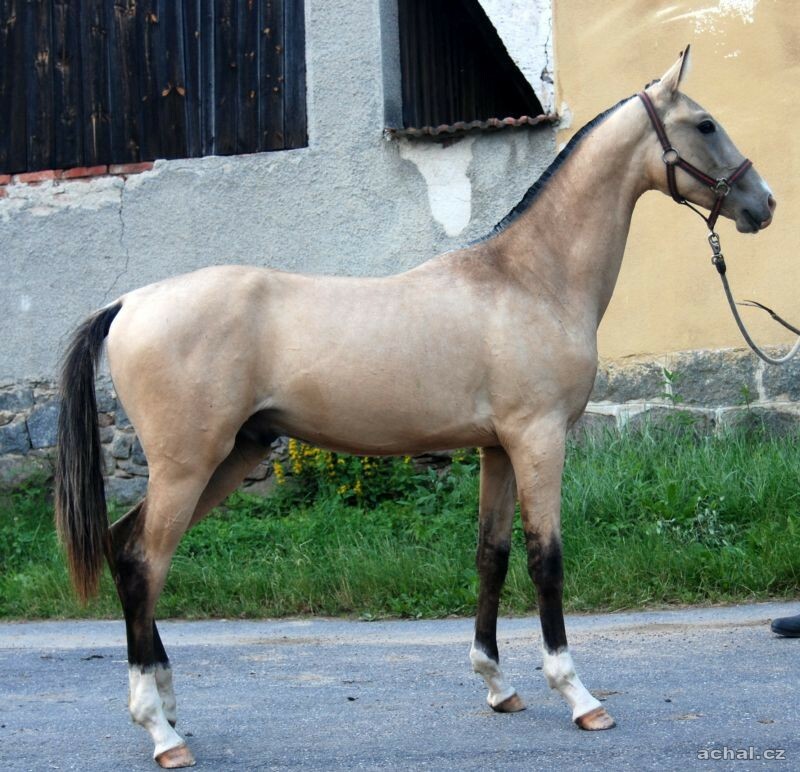 Serdarjan has got strong body and good movements together with excellent stamina. 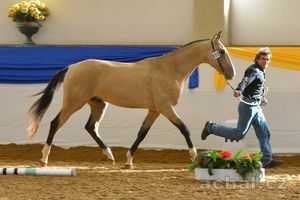 He is friendly and sociable, though having more sensitive nature, he is very human-listening and extremely cooperating in training. 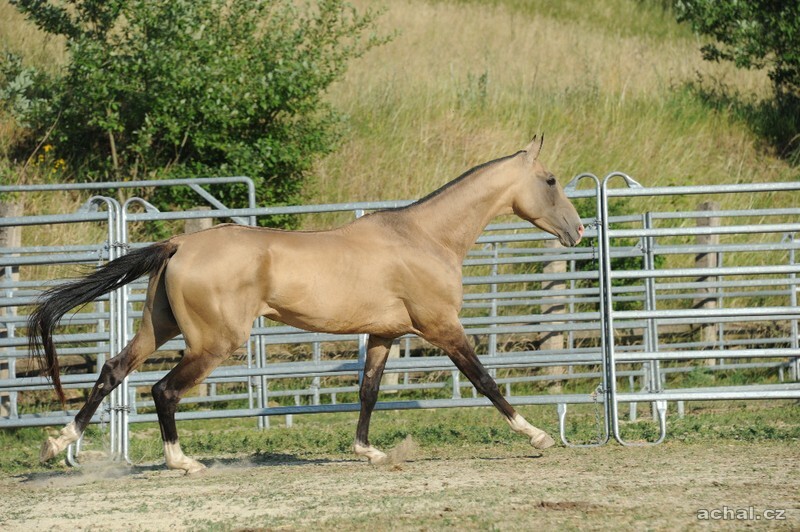 He has started under saddle last year and got lots of groundwork before. 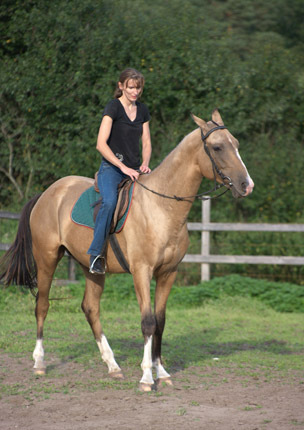 He is full of go and soft to ride. 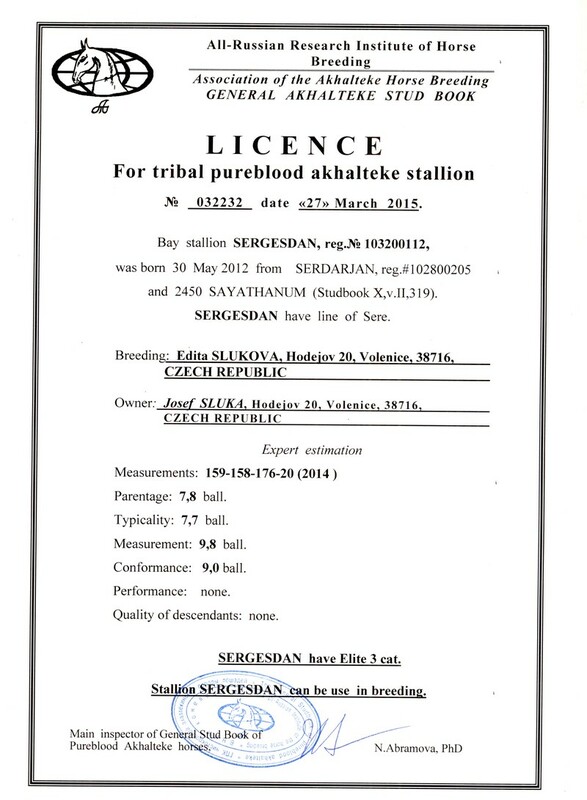 We plan to use Serdarjan also in breeding because of his excellent conformation, nice solid type, good pedigree and exceptional workability. 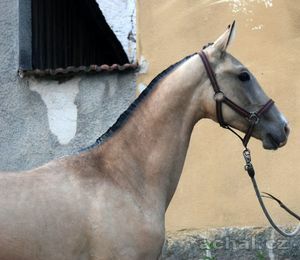 mother of Serdarjan - FIRIUDA - bay mare. 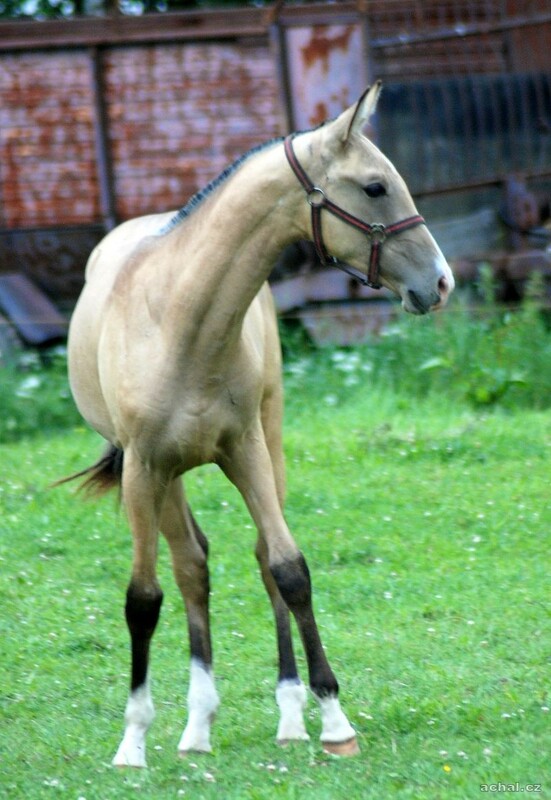 Born: April 13th, 1995 at Stavropol Stud, Russia. Line Gelishikli (Gundogar). Family Fantaziya (Gezel). 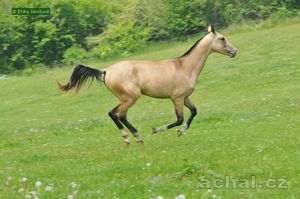 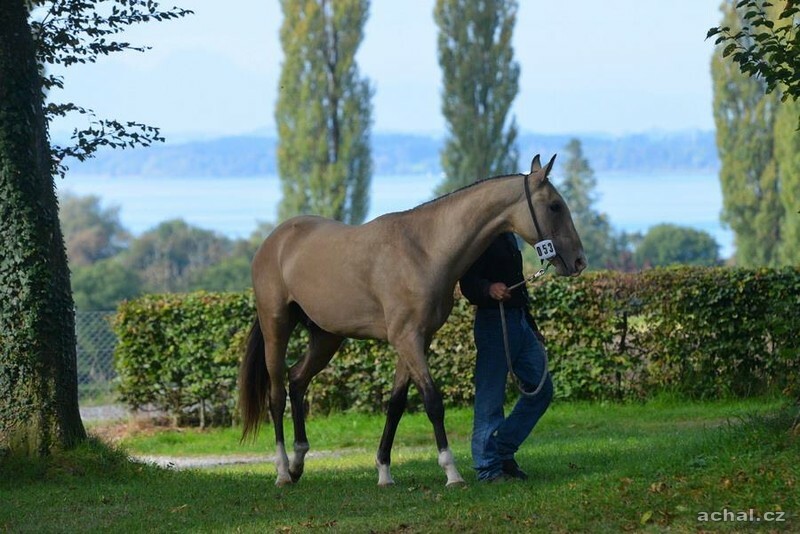 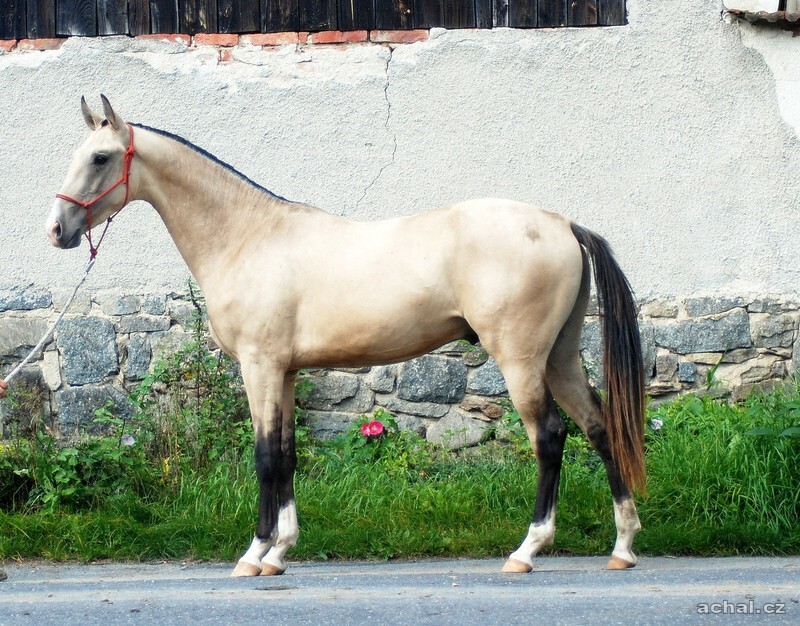 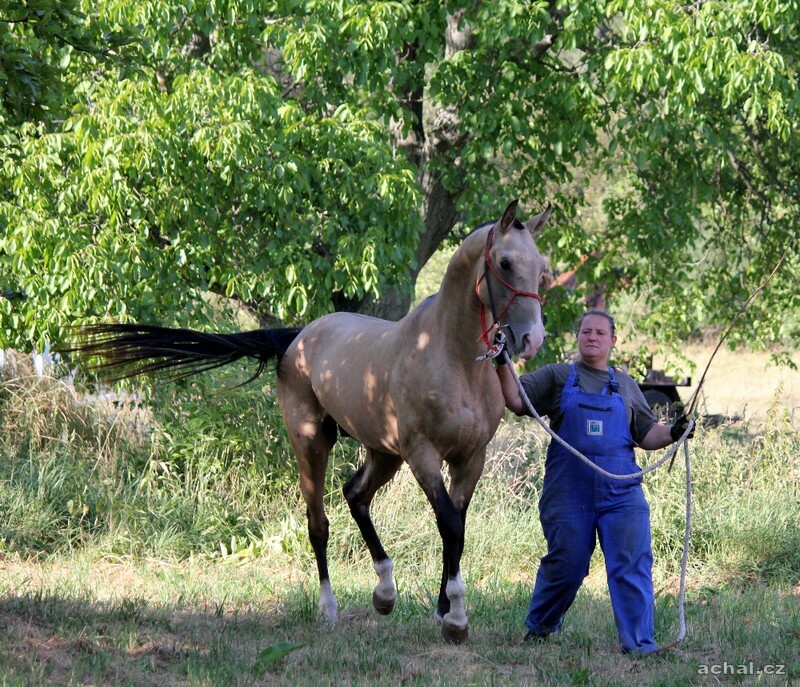 Firiuda is a bay Gelishikli-line inbreeding mare who is coming from new sireline Gundogar. 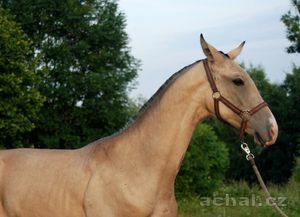 She was born in 1995 at the Stavropol Stud, Russia. 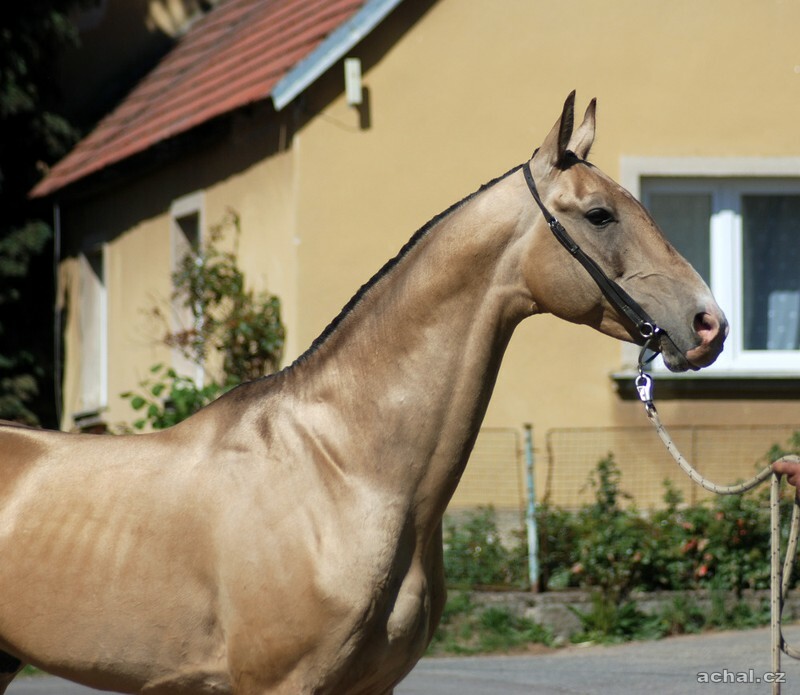 Her sire is 1186 Djeikhun and dam 2965 Fonema 13 - Fonema is also the mother to Feisal who is a young sire at the Stavropol Stud. 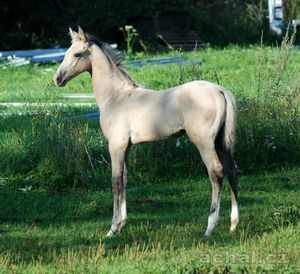 By dam Firiuda comes from damfamily Fantaziya (Gezel). mother of Sergesdan - Sayatkhanum the mare's chestnut mare line Gelishikli, who was born in 1985 in Dagestan. Elite class III - stud-farm "Dagestanskii"
She is the daughter stallion 985 Dagestan and mares in 1726 Arfa (line Arab). 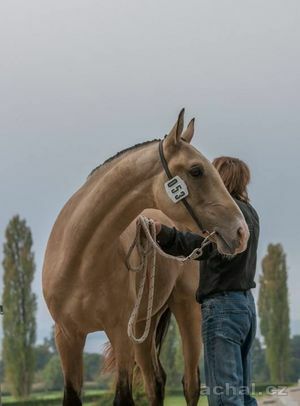 She comes from a family of Temme. 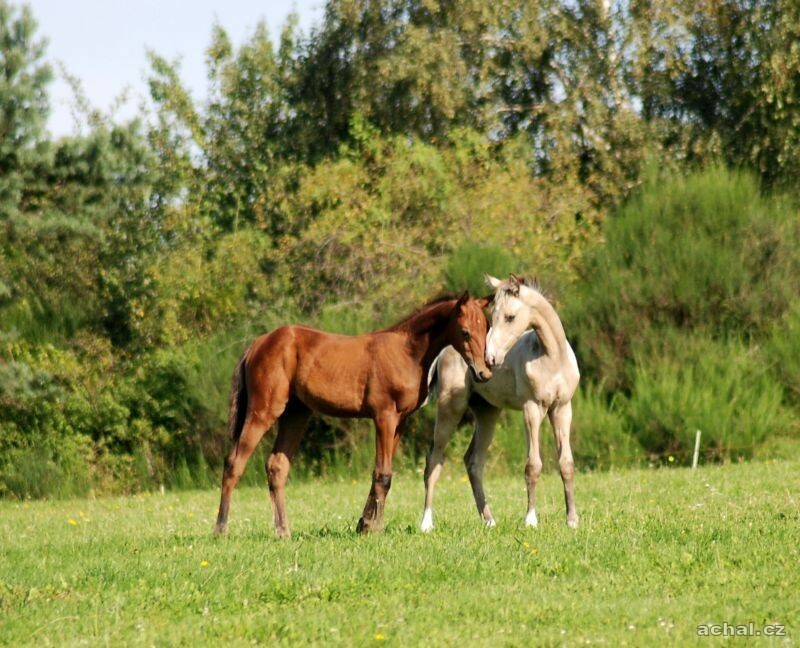 It is a quiet mare character and temperament.The herd is easygoing and treatment as well. 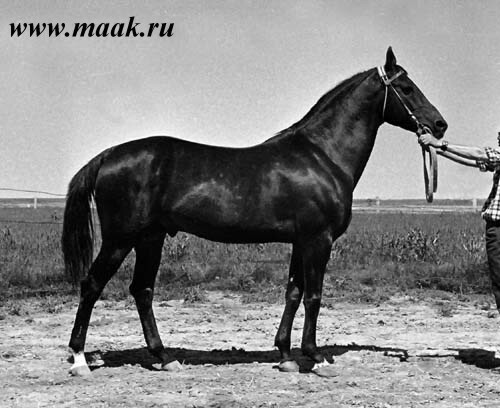 father Sayatkhanum - Dagestan is a stallion who was born in 1976 kolkhoz Gubdenskij in Dagestan. 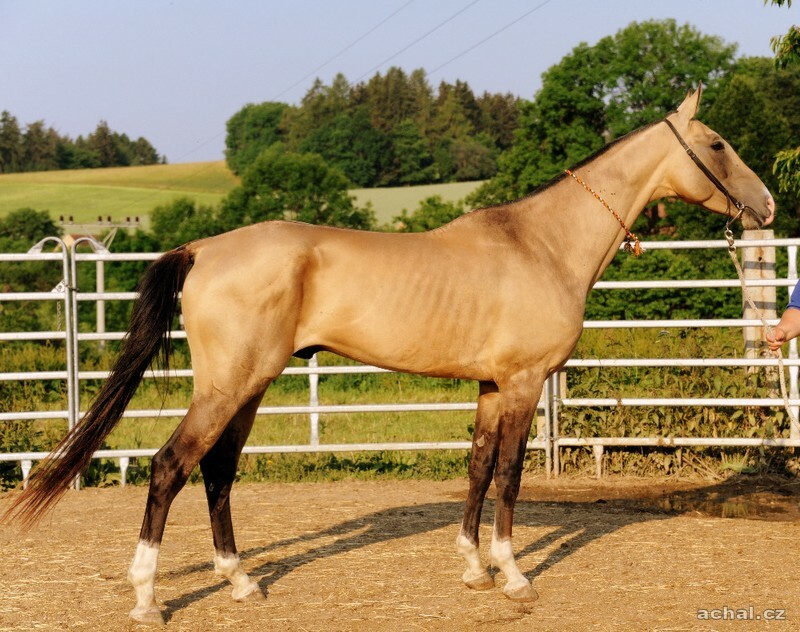 Dagestan was of medium height KVH 157 cm, from Elite, 9-8-8-8 -, 157-154-175-19, His head was dry, flat profile, long neck and high, with strong tap and sloping shoulder. 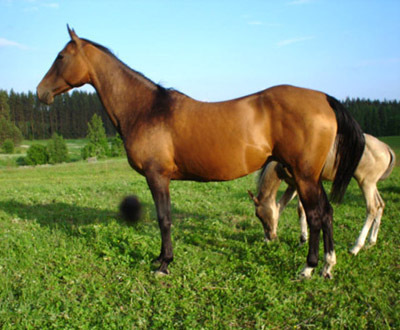 This farm eventually became independent and became famous stud farm Dagestanskij. Mr. Sambora prized colt qualities from birth so high that he was a stallion named Dagestan became a symbol akhalteke breed in this country. 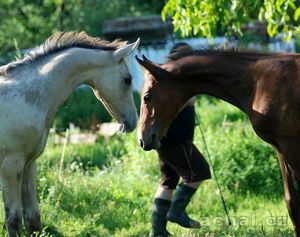 Dagestan was very valuable source. His father was Julduz, widely regarded as the best son of the founder's own line Gelišikli, and many breeders who have teamed up with the ideal of akhalteke horses. 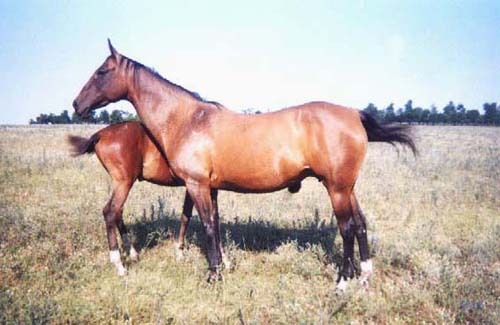 Mother of Julduz the mare Gul, depending on the quality of offspring Tersk best mare stud. Parental pair of mares was a stallion - mare Sapar Chan and mare Zerene, who in addition to beget another elite sourozencea it Gundogar, Guldžachan, Gezel. 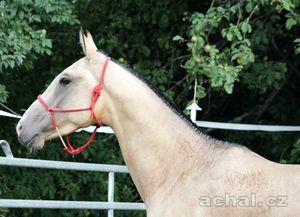 Mother of Dagestan was buckskin stallion Fakie daughter Karaz and mares Fergezel. 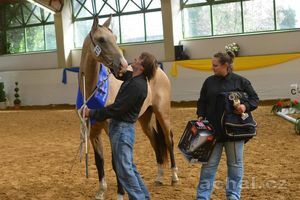 Fakie had excellent racing performance won prizes "Otkrytia" and Letnij Priz achieved an excellent time to 1600 -1,46,1. 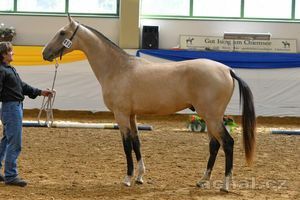 It was a compact mare executive with a strong tap dry and strong legs. 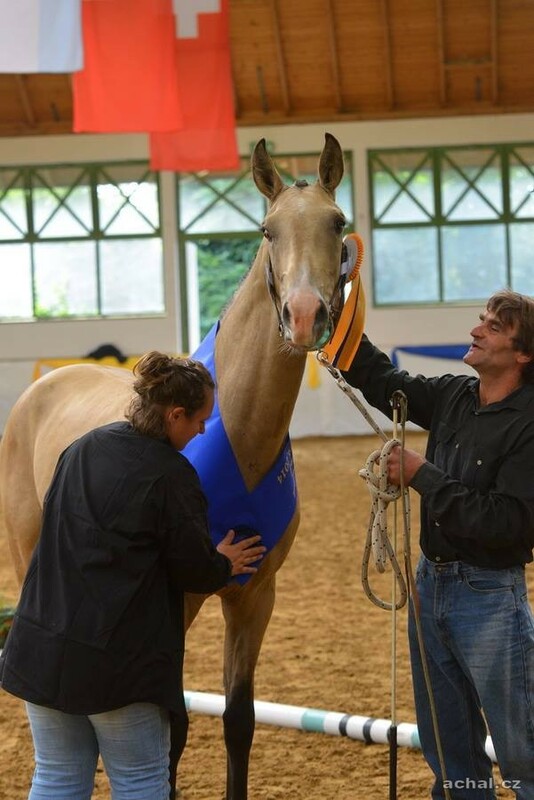 Fakie's father was cremello Karat, son Tajmaze excellent, one of the rare representatives of line Everdy Teleke. Type was Karat Like her mother, Kara Vranča kyz, right, sister of the above mares Gul. Mother Faki, very typical and noble mare Fergezel was to Terského stud imported from Turkmenistan. 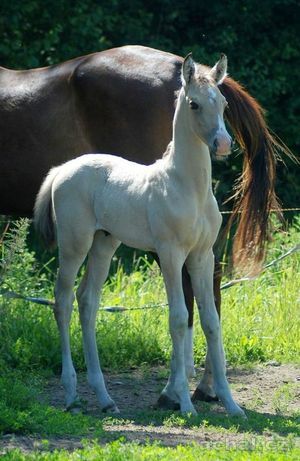 Her father was Fakir Sulu, mother Mama Gezel. Dagestan pedigree is full of inbreeding, in III-III in Fakir Sulu IV-III Sapar Chan, IV-III Zerene, IV-III Gezel. As a two-year Dagestan began his racing career in 5 years ran on the track in Pyatigorsk, a 6 year old on the runway in Krasnodar. The strong competition is already a two-year klsických affixing the race, but was successful in 6 years. 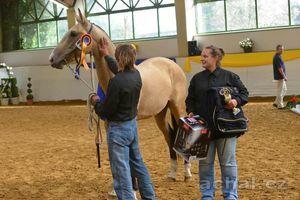 Then he won Vstupitelnyj Yarn Sravnenia, yarn Turkmen SSR. 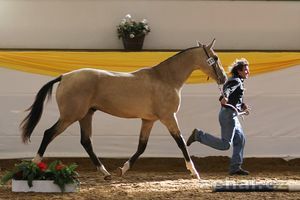 His progeny excelled not height, but dry constitution,performance, lively energetic temperament. 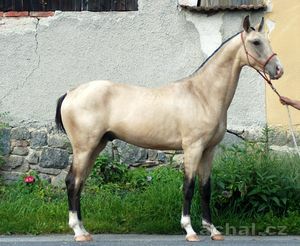 Dagestan has few pure descendants of 36 of the 19 stallions and 17 mares. 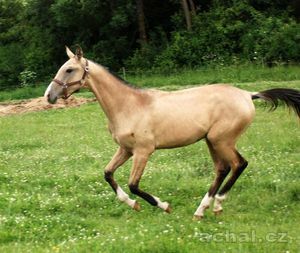 Not all of them were typical, in addition to extremely typical and thoroughbred horses born after Dagestan and horses coarser and simpler. 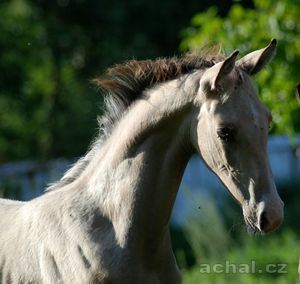 Among the best descended from a stallion can include Gajsan 7 of Gaja (Vatanči-Golubka) Doremir of Dandža (Gar-Džachan) Gelishikli II of Aira (Kaltaman-Alice 2), of Kalina Dorkuš (Enough 2 - Keniz) mare Miller of Michmanli (Opal-Gracia) which in conjunction with Gajgysyzem always gave three grand children Margarétka, Mangyta, Murgab. 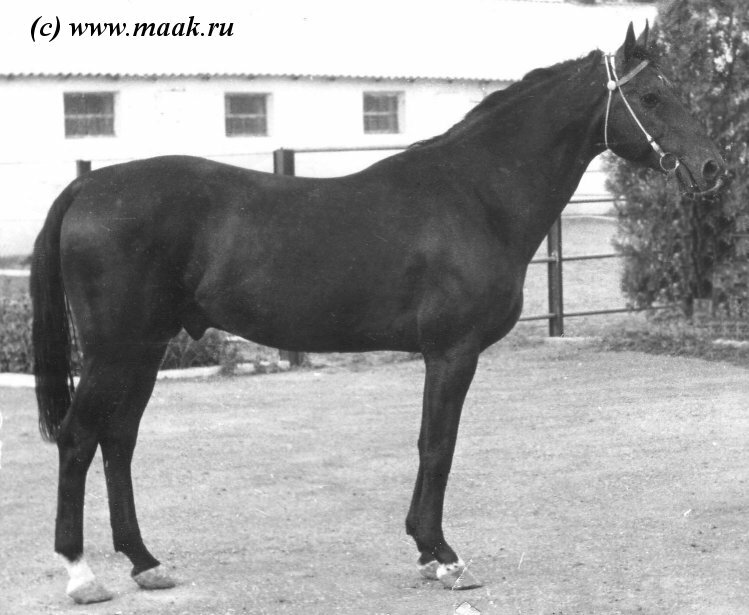 Dagestan died in 1999 at stud Julduz in Krasnodar Region. 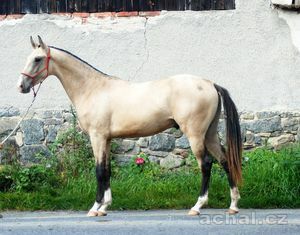 668 Absent: black, b. 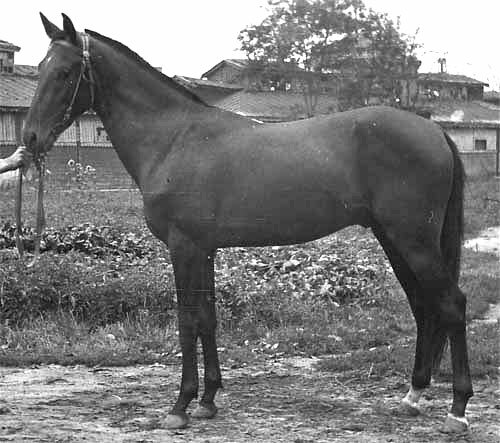 1952 Džambulském stud of mares Bakkara, ran a two-year flat racing. 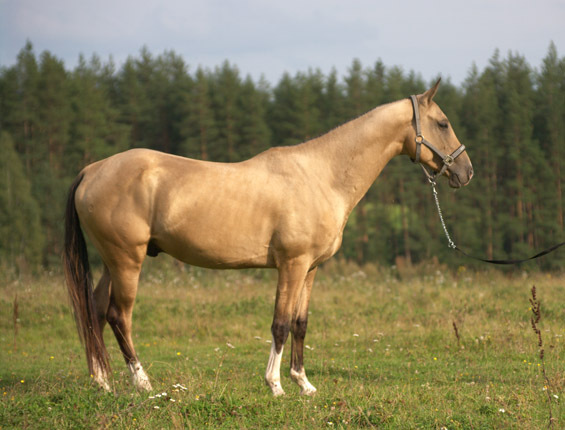 In the years 1955-1968 were included in dressage training, the rider S. Filatov won the gold medal at the Olympic Games in Rome in 1960. 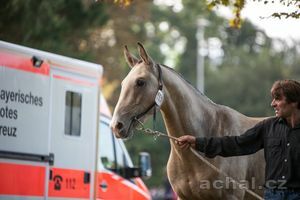 Four years later in Tokyo and won a bronze medal four years later, at the Olympic Games in Mexico, with a rider I.Kalitou ranked fourth. 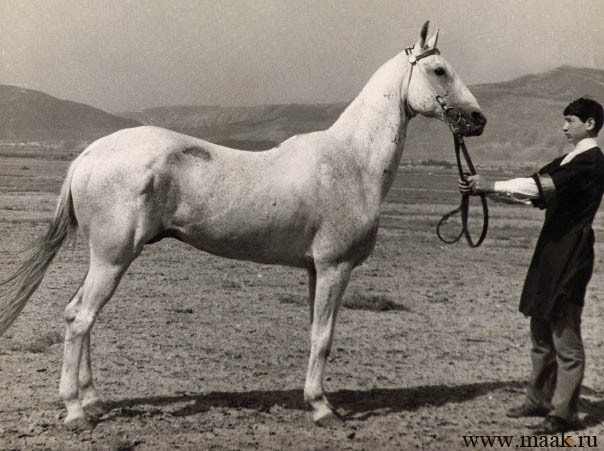 In 1958 he won the title of Champion of the breed. 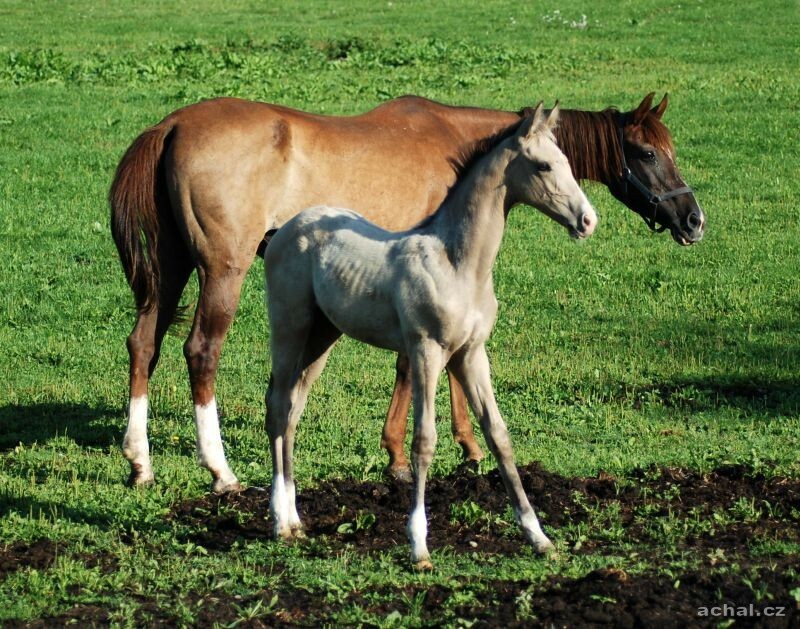 Absent proved to be an excellent mother's father, his daughters formed the core of the parent flock Lugovského stud - 1858 Takkapara (dam sire 971 Caliphate), 1723 Arkada 3 (dam sire 1168 Gemany 11) 1713 Aksu 9 (dam sire GercoG 15). 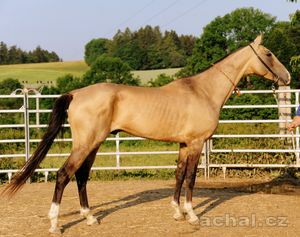 26 Arab roan, was born in 1930. 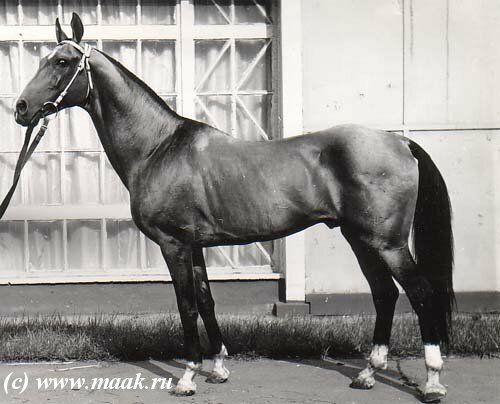 He ran flat racing and five years old (in 1935) participated in the legendary march from Ashkhabad to Moscow. 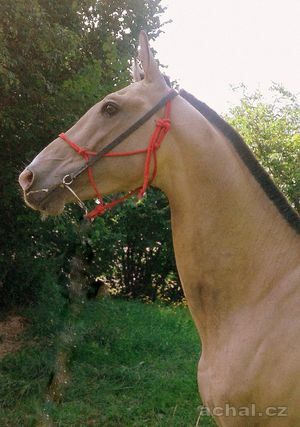 In Moscow, was donated by General S.M.Buďonému. Under the name of Kazbek participated in jumping competitions and Eventing. 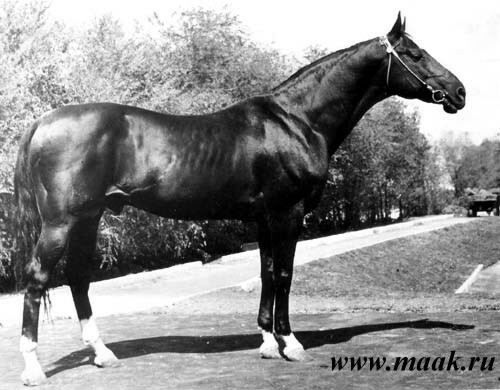 As a 17 year old was included in Tashkent are breeding stud, but unsuccessfully, no offspring are born after him. He therefore moved to Džambulského stud, where he left behind a small number of offspring. The breed worked four of his sons, Alam 677 (of 1120 Poll) 670 Avangard (from 1196 Erka) 688 Artist (a sect) and 668 Absent (from Bakkara). 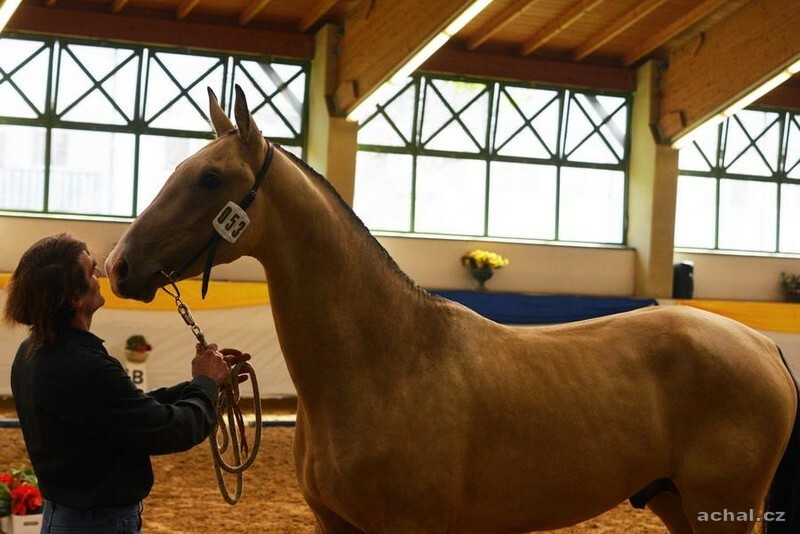 father of Serdarjan - buckskin 1099 Serasker, was born in 1985 at studfarm Stavropol. He raced as 2-3 years old, with average succes, he got one win in 9 starts, twice placed 2nd and three times fifth. At the exhibition in Tbilisi in 1988 he got Diploma of II.degree. 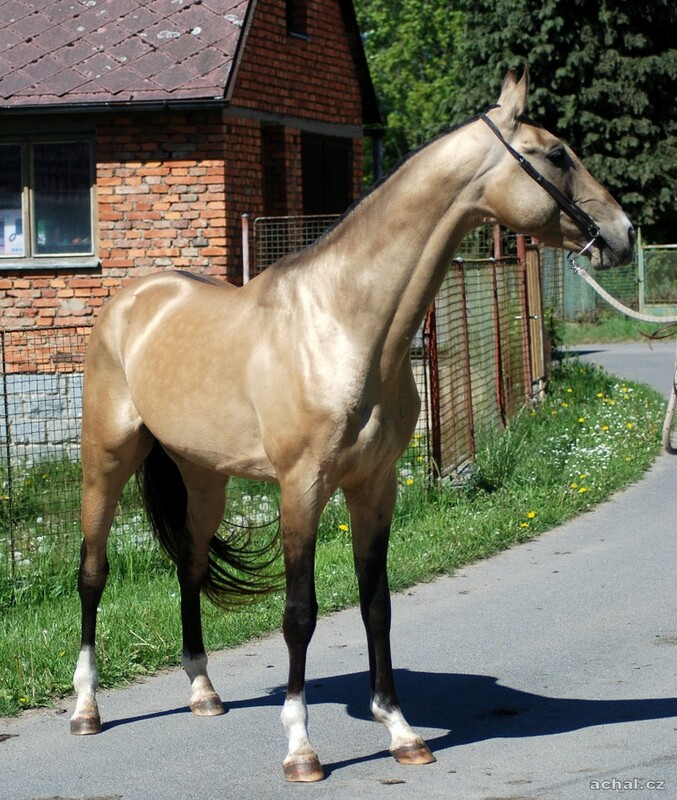 Among his offspring we can find excellent racehorse Aisor (out of 2527 Azra), Oaks winner 2625 Gaisana (out of 2210 Greza), winner of "Prize Otkrytia" 2914 Pustynya (out of 2412 Palmira) or Russian Reserve Champion among mares Magistral (out of 2797 Margaritka). 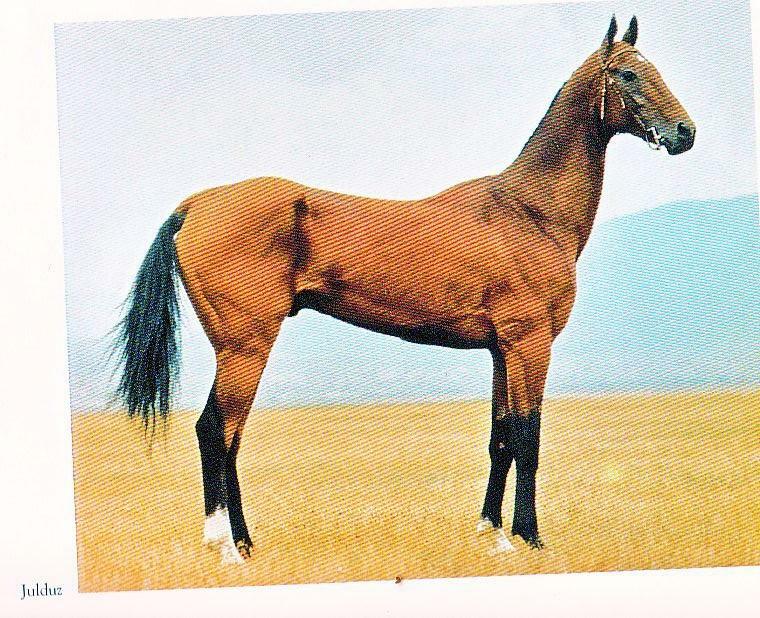 Serasker´s dam is dark bay daugher of Karakir, mare 1652 Sayat, born 1968 at Tersk studfarm. 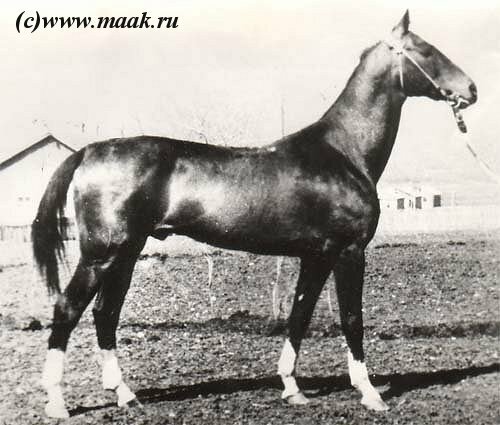 Sayat produced three breeding stallions (Serasker, 973 Abdulrakhman, 1011 Sultan) and three daughters.Serasker stallion in 1099, was born in 1985 in Stavropol stud. 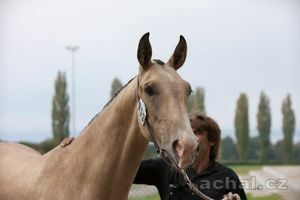 As a 2-3-year started at the racetrack with average achievements in nine starts earned one win, two second and three fifth places. 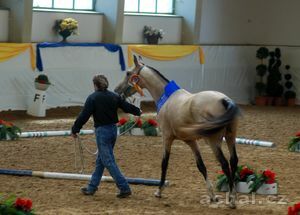 The exhibition in Tbilisi in 1988 received a diploma junior. Among his descendants can be found on the runway excellent Aisora ​​(from Azra 2527), winner of the 2625 Oaks Gaisano (from Grez 2210), winner of "The prices Otkrytia" Pustynju 2914 (of 2412 Palmira) or the Russian Reserve Champion Magistral (from 2797 Margaritka). 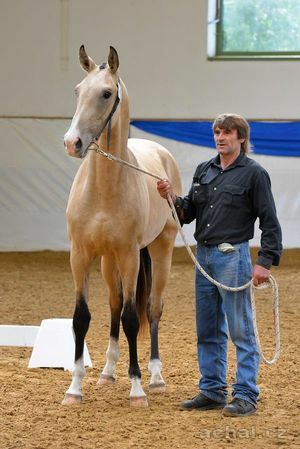 Father of Serasker - golden buckskin stallion 919 Sere, born 1965 in Turkmenistan. 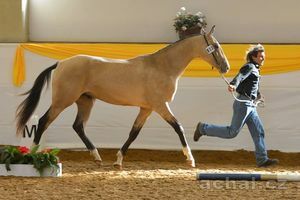 Sere quite successfully competed on the track, as a 2-4-year, total 28x (7x1., 14x2., 6x3.). In 1978 he won the title of Champion of the breed. 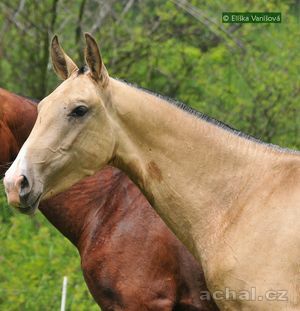 Dim successors in breeding stallions became Mejdanli 1073 (of 1591 Magnolia, line Gelishikli), then stallion Ancara 1029 (of 1408 Agave), Čakan 1107 (of 1469 Guldžachan) Ginduvar 982 (of 1461 Gracia), 1067 Koldun (from 1575 Koldunja), 1017 Janyčar and the already mentioned 1099 Serasker, in Europe, 1018 Abbas 20 (of 1726 Arfa) and 1196 Elbek 40 (of 1505 Edegen). Perhaps more than in the production of sires was successful as a mother father - of his daughters we should at least 1,867 Feju II, 1834 Paris, 1880 or 1752 Yalma Guns. 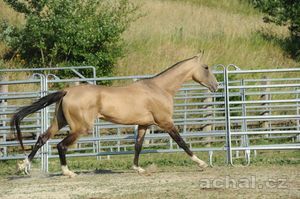 This mare through his offspring very deeply affected Arabian breed.